Ladbrokespoker.com has today launched its new, improved poker platform for the benefit of its many existing and future players. UK Poker News took the opportunity to have a quick game on the cash tables this morning and can vouch that there is a more streamlined experience on offer. One criticism of some poker software platforms is that they can suffer from the "more is less" syndrome, cluttered with bells and whistles and complicated betting bars and buttons. The previous platform at Ladbrokes was not immune but there is a clearer set-up on show now with improvements to the betting buttons and slider. These are the crucial elements for a player. The lobby is also more neatly laid out in large, clear displays with additional tools. There are now some extremely useful features including the ability to customise the lobby to suit your poker planning. You can save your favourite game (such as $1/2 pot limit Omaha) under My Favourites for immediate access upon loading, or your favourite players (friends and fish alike) under My Buddies. Then there's My Calendar (for future tournament dates and planning), and My Tournaments for those regular appointments! Reminders will be sent when one of your scheduled games is approaching. Ladbrokes have enabled Quickbank for instant top up of your funds even without leaving the table. You can transfer funds into the Ladbrokes wallet or between platforms, such as sportsbook to poker, and convert to chips as soon as the current hand has played out. Another "in-game" addition is the ability now to see the cash and MTT lobbies in the chat area so you can keep an eye on how you are progressing in the tournament or see what other games are available. This is particularly handy for the multi-table specialists amongst you. From a strategic playing angle, it is sometimes worth showing an opponent what you are folding so Ladbrokes has obliged with a "fold and show" facility for those "advertising" moments in a game. Ladbrokes Poker is a leading platform for top-grade multi-table tournaments and in keeping with the desire for reflecting live play, Ladbrokes has introduced a deal-making facility for those all-important final table discussions after a long session. 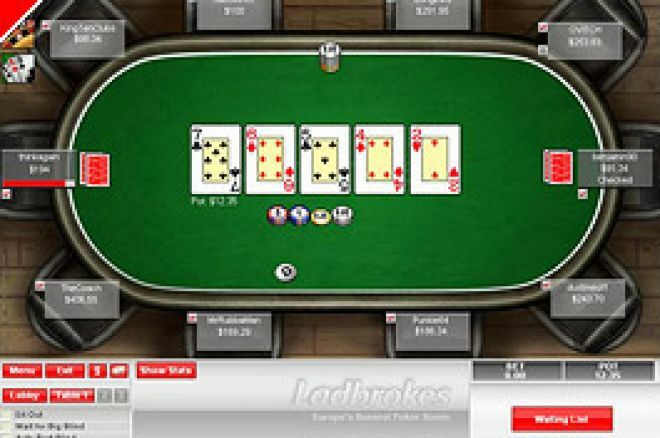 - Access to Ladbrokespoker.com via embedded pages within the poker software, including the forum, leaderboards, news and promotions. - Colour coding of tournaments for ease of identification by players. - Some specified tournaments will allow for variable starting chips. - A facility to select "auto re-buy" in those types of tournaments so that funds will be taken from your account automatically if you intend to stay in the tournament until the re-buy period ends. - There will be a late registration facility in re-buy tournaments. Similarly, an "alternates" system will be available where a registering player has found the tournament to be full. He or she can then take the place of any early eliminated players for a specified period. There are yet more but we at UK Poker News have no doubt that the online poker experience for new and regular players alike has just got better! Ed note: Enrich your poker experiences and download the new and improved Ladbrokes Poker and earn a $100 bonus too! Titan Poker Announce 13 Will Be Lucky For Some!